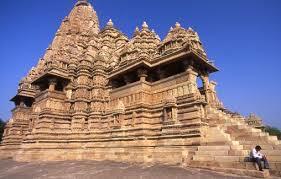 Here is Some Informatuion about Kandariya Mahadev Temple in Khajuraho Madhya Pradesh India. The Kandariya Mahadev Temple is located in Western Temple,Khajuraho,Chatarpur, Madhya Pradesh.Kandariya Mahadeva Temple is the largest, tallest and most beautiful Hindu Temple of the Khajuraho Group of Temples. This medieval marvel dates back to 1050 BC and was built by Raja Dhandadeva, a strong Chandela ruler. The temple is embellished with ornate carvings and sculptures. Its main spire (Shikhara) depicts Mount Kailash and stands with a height of 31 meters. Surrounding this spire are other 84 miniature spires (Urushringas). This temple is dedicated to Hindu Lord Shiva, and has a Shiva Linga made of marbel, as its sanctum. About 646 statues are installed in its boundary that looks even more appealing. The façade of this temple is east facing. The entrance has staircase and porch that is adorned with garlands chiseled out of a single stone. It is estimated that Kandariya Mahdeva has about 870 sculptures, with one meter height each. On the inside is the deity of Lord Shiva, holding a trident and snake, with the deities of Vishnu and Brahma. The whole plan of this temple is somewhat similar to Lakshman and Vishwanath Temple; with all rooms arrayed from east to west and balconies on the south and north. Most of the temples at Khajuraho were constructed between 950 and 1050 CE by the Chandela dynasty, who became the most powerful rulers of northern and central India from the 9th to the 12th century, achieving their zenith around 1030. According to historical records, during the 12th century the site had as many as 85 temples spread out over 20 square kilometers. Today, only about 20 temples are still standing. Of these, the largest surviving Saiva shrine is Khandarya Mahadeva, while the largest Vishnu shrines include those of Chaturbhuja and Ramachandra. Although still in active use in 1200, during the next century the complex was overrun by forces of the Delhi Sultanate, under the command of the Muslim Sultan Qutb-ud-din Aibak. Under Muslim rule, some temples were desecrated, while the remainder were left to rot. In the 1830s, a British surveyor, T.S. Burt, "rediscovered" the temples and brought them to the attention of the rest of the world. By Road :Khajuraho Group of Monuments are located approximately 10 kilometers off the National Highway 75. The nearest city is Chattarpur which again is well connected by road from Bhopal. 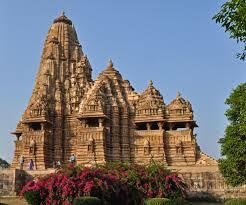 One could also travel to Khajuraho by Road from Delhi which is approx. 600 kilometers away and Jhansi which is 177 kilometers away. By Rail: The Nearest Railway station is Khajuraho. By Air: The Nearest Airport is Khajuraho Airport.